It’s my parent’s 50th wedding anniversary next year, and me and the siblings are already planning how to celebrate it. My eldest sister suggested that we rent a house with a pool again, like we did years ago and stay for a night or two with the entire family. Sort of goes without saying that I’ll be the one searching for this house. Luckily enough, Gail invited me for a resort opening a couple of weekends ago. Turns out it was for the re-opening of the Blue Dolphin Resort in Balayan, Batangas. 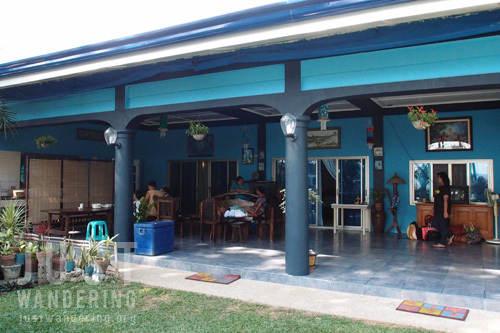 The resort has both fan and air conditioned rooms, and a nipa hut that can house up to six persons. Rates start at Php 2,000 per night (fan room). 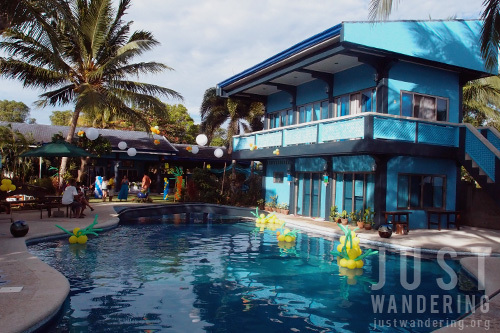 For big groups, the resort can be rented to your exclusive use for Php 20,000. Not a bad rate if there are 30 of you using the facilities. Open space for dining tables, programs and dance contests? Food isn’t included in the rate, nor do they have a restaurant, but the kitchen is available for your use (stoves, pots and pans, dishes and cutlery included) for a minimal fee. There are plenty of open areas if you’re going to be doing games or programs, and a sort-of promenade with a view of the beach. Balayan’s beach is black sand, which makes the water look dark and foreboding, but it’s actually pretty clean. If salt water isn’t your thing, you can dip in the pool instead. A bridge divides the pool — a wading pool for the kids, a bigger and deeper pool for the adults. Are you a singer, not a swimmer? You’re free to use and abuse the resort’s karaoke machine that was strategically placed near a gazebo by the beach. Balayan is about 3-4 hour’s drive from Manila. Though not one of the popular beach choices for Batangas, it’s great if you’re looking for that small-town vibe, away from the crowds. The last time we were in Balayan, I almost drowned. Hence, I’m scared of open water up to this day. Ahihi. Anyhoo, 20k ain’t bad for 30 people! Nice venue for team building or family reunion. This is quite amazing dolphin resort. 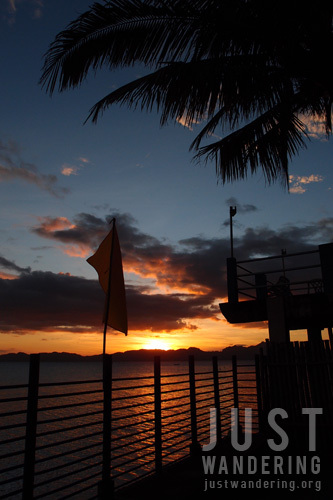 We would be probably be including this resort in our package travel to our fellow Filipino travelers. This could be a very excitement and wonderful place. Thank you for posting your article, I found it really interesting !